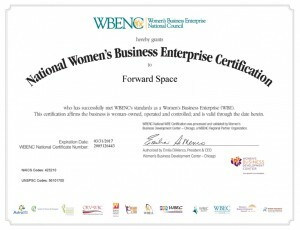 Forward Space is proud to be a woman-owned business certified by the Women’s Business Enterprise National Council (WBENC), the largest third-party certifier of businesses owned, controlled, and operated by women in the United States. 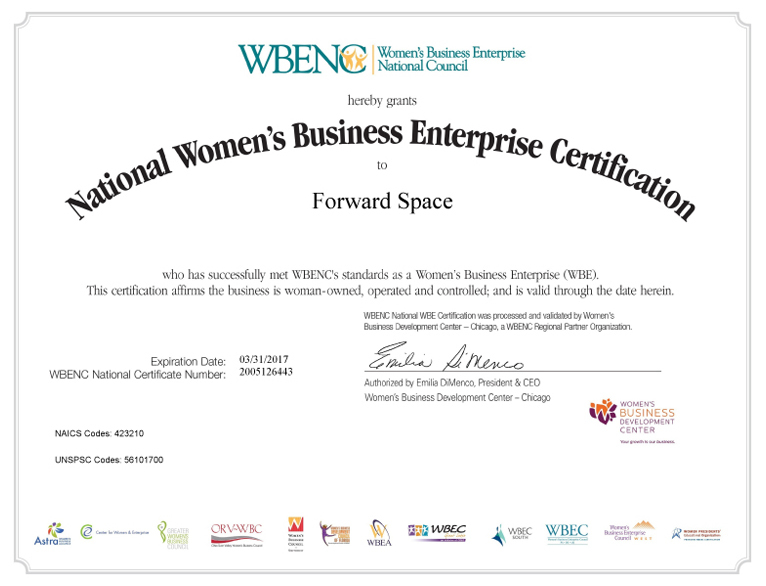 We are a privately held, women’s business enterprise (WBE) that possesses both the experience and resources to fulfill any project regardless of size or complexity. This has been a great asset to our customers in helping them achieve their diversity goals, while assuring them that they have partnered with a company that is both competent and capable with regard to meeting their needs. Our President/CEO, Jenny Niemann, is responsible for the strategic leadership of the company. Jenny has over 22 years of experience in senior management and leadership positions in the industry. Her career has been focused in the areas of innovation, sales strategies and process improvement. She has experience building strong client relationships and is also committed to the industry and community through CoreNet, Young Presidents Organization (YPO) and through support for United Way. Click here to view Jenny’s bio. Click image below to view certification. We are also proud to be a member of the National Association of Women Business Owners (NAWBO) – an organization representing over 5000 members and 60 chapters across the country. Founded in 1975, NAWBO is the unified voice of over 9 million women-owned businesses in the United States representing the fastest growing segment of the economy.